What is a project template? I am new to Eclipse, where should I start from? Where can I find DVT Help? How do I see and configure the key shortcuts? Are there any backup files in Eclipse? How to use Working Sets for filtering Problems/Task/Search views? How do I associate a project with both DVT and CDT? Can I use vi/vim along with DVT? Can I perform dos2unix or unix2dos from DVT? How can I configure Eclipse to use a local CVS repository? I am using the Common Desktop Environment via Citrix and experiencing crashes. What can I do? How do I change the background color of the Editor? How do I change the color of the interface? How to apply the dark color theme or other themes? How do I change the tooltip colors? How do I change Internet Proxy Settings? How do I link mylyn with Bugzilla? How do I print source code? How do I disable Eclipse Software Sites? How do I revert to a previous version? What are the most common shortcuts in DVT? How does DVT integrate with emacs? How does DVT integrate with CVS? How to set an environment variable within a Run Configuration? How to run a remote Unix commnad from DVT Eclipse for Windows? Sometimes I experience DVT GUI hangs, what should I do? How to set multiple paths as sources of predefined projects ? Lines are suddenly changing indentation when I edit text or move the cursor through the editor. How to change the directory where the build log file is saved ? How to find the DVT logs on Linux/Unix ? How to create resource filters ? How to create custom shortcut and button for a Run Configuration? How to copy the full path to the file in the current editor? How to adjust the console logs filters matching parameters? How to modify the font size in the code editors? How to automatically checkout/lock files from the revision control system ? How can I see if a file is read-only? How can I open a file in DVT from the terminal? How can I open a file in DVT from Questa? How do I change the name of the xterm opened by a DVT Generic Run Configuration? You can embed reminders in your source files by adding comments prefixed by certain "keywords" called task tags. All reminders are listed in the Tasks View. If it is not visible, open the view from menu Window > Show View > Other > General > Tasks. Double click on a task to jump to the marker definition. 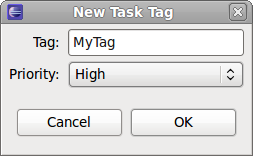 You can specify if the tags should be considered case-sensitive and if the tag name should be displayed in Tasks View. DVT will recognize the new tag and highlight it in code comments. Note: it is recommended to rebuild the project so that DVT rescans all files for reminders.